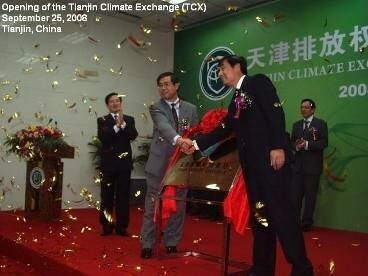 A cannon fired golden confetti into the air to celebrate the opening of China's first cap-and-trade pilot market, the Tianjin Climate Exchange, in 2008, to help address climate change. Then, in 2015, after establishing six additional pilots, China announced it would soon be implementing a national cap-and-trade system, an indisputable sign that China planned to use carbon pricing to reduce its greenhouse gas emissions (GHGS), the gases that are causing rising temperatures and climate change worldwide. The European Union also continues to use cap-and-trade, while in the United States, as national policy continues to evolve, California and states in the northeast also operate cap-and-trade systems. And as the world prepared for the 21st Conference of the Parties to the Framework Convention on Climate Change (COP-21), discussions continued worldwide on how to link existing market systems, while also examining carbon taxes and other pricing policies. This intensifying discussion of carbon pricing converges with another important trend: the mainstreaming among major Wall Street firms of recognition that the value of a company is increasingly tied to how that company manages its environmental risks and liabilities. New financial products that differentiate between low carbon and high carbon performance are becoming the norm, whereas the norm was just the opposite for as long as the world has been directly discussing how to come to terms with climate change -- now nearly 25 years. In 1992, when the world's leaders first came together on the topic at the Earth Summit, it would have been unthinkable that the S&P 500 would one day track closely to S&P's new benchmark Carbon Efficient equivalent. Yet, today that is precisely the case. It would also have been unthinkable that capital flow itself would be tuning in to climate change risk. This revolution is also occurring. For example, according to the 2014 Global Sustainable Investment Review, assets committed to some form of environmental, social and governance screening (ESG) grew by in the United States by 76 percent in just two years, from 2012-2014 -- from $3.74 trillion to $6.57 trillion, or one in six dollars invested. This momentum and heft, totally absent from former climate change policy considerations, is driven by client demand for environmentally responsible money management, and could well dramatically shift capital flows toward companies and new technologies that favor serious greenhouse gas reductions. The current convergence between carbon pricing and investor shifts, while unforeseen, is nevertheless key. Carbon pricing systems are of increasing relevance for global investors because they make visible otherwise hidden costs, projected and actual, by attaching a cost to emissions on a per ton basis that must be reported and verified, much like other financial information. As investors become more attuned to minimizing environmental risks, and put together more environmentally favorable portfolios and funds, carbon pricing will concomitantly become a new factor to help decision-making. A clear price tag hung on every ton cannot be ignored, even though the tons themselves are noxiously invisible as they rise into the atmosphere. By making otherwise hidden costs visible, carbon pricing is relevant for investor decisions because it means investors can calculate relatively easily the present and future cost liability an emitting company may face. Conversely, carbon price signals illuminate possible eventual cost savings from emissions reductions and can serve as a surrogate to estimate the value of innovation and emerging new technologies. As carbon pricing becomes integral to global economics, "cost of carbon" will gradually emerge as a fundamental indicator in evaluating corporate near-term performance and management, as well as strategic vision and prudence. The 2015 report on carbon pricing from CDP, which gathers environmental information from public companies for use by investors, reflects this increasing corporate recognition of the importance of being ready for the costing of greenhouse gas emissions. The 2015 report showed a tripling in the number of companies reporting using internal carbon pricing to gauge their risks and costs -- up from 150 companies in 2014 to 437 a year later. In Asia, over ten times as many corporations disclosed they put an internal price on their carbon emissions this year - 93 in total up from 8 in 2014 - pointing to the influence of China's expected national emissions trading system, similar systems emerging in South Korea and South Africa, and the general expectation of increasing regulation of emissions. .
For now, absent a global carbon pricing policy guideline, companies disclose various pricing levels, and express or apply them in local currencies for internal planning purposes only. But, as regulatory regimes emerge worldwide, and carbon markets evolve into full-fledged commodities markets like any other, ultimately carbon prices will be expressed in international currencies and become fungible as markets and policies link. In this way, carbon pricing can emerge as an international language, translating the language of tons to the language of money. Investors can then more easily compare costs one company to another, and monitor how well a company is preparing for the demands of a low-carbon economy over time. Investor decisions depend on a combination of analysis, experience, judgment, strategy and data. As mainstream investors become increasingly aware that addressing climate change is important to policy makers and the general public and that low-carbon investment choices and strategies are preferred by clients, carbon pricing is likely to become a key data point in the mix of investor financial tools. And if our world, so troubled and yet precious, can truly organize itself to take on the threat of climate change, golden confetti can rain in celebration everywhere one day.